My apologies for the lateness of this post but I just realized that tomorrow is Groundhog’s Day and while this isn’t a major holiday, I do have some ideas for how to introduce or reinforce this at home with your child. Last year, Andrew was at home sick and it occurred to me that they were probably going to discuss this a bit at school and I didn’t want him to miss out. I had a book from my teaching days called Groundhog Day by Gail Gibbons (a favorite author of mine) and there are many other Groundhog Day themed books out there, fiction and nonfiction. I love to incorporate literature whenever possible, especially when explaining a concept like this, which has its own stories surrounding the coming of Spring. I also got some activity ideas from one of my favorite websites, EnchantedLearning.com (click here to go to their groundhog activities page. I pay to be a member but they also have free materials and ideas on their site.). They have matching, math and literacy activities as well as basic books to print out. I love to use their sheet that has vocabulary words and pictures. I usually cut them up and use them as a matching game but they can be used as is to work on drawing lines connecting the word with the correct picture. This sort of thing allows me to introduce and talk about vocabulary with Andrew that might not naturally come up in our everyday conversation (and these days if it doesn’t have to do with people’s ages or types of ceiling fans, it won’t come up at all! 🙂 ). The pictures help give a symbolic representation of what the word means but if some of them seem too advanced for your child, disregard those and only use the pictures and vocabulary that your child is ready for. 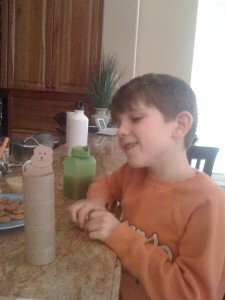 This was a little project we did to get in some pretend play about the groundhog. I took some brown construction paper and made a very basic drawing of a groundhog (I am by no means an artist and used to tell my students, “If you don’t laugh at my artwork, aka stick figures, I won’t laugh at yours!” Obviously I would never laugh at a student’s artwork but you get my point! 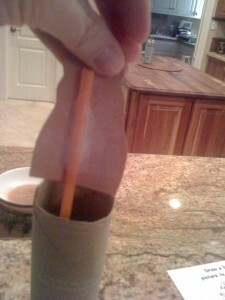 ), cut it out and taped it to a straw. 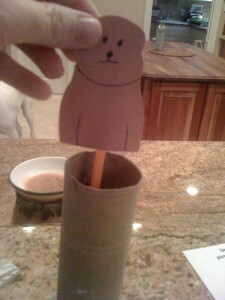 The back of the groundhog taped to a straw. I then took an empty paper towel tube (or a toilet paper roll) and placed the groundhog inside so he could “pop” out to see his shadow. I explained and showed him with a flashlight how the sun, and other light, creates shadows. Sorry for the blurriness but I wanted to show his true happiness at this basic puppet! 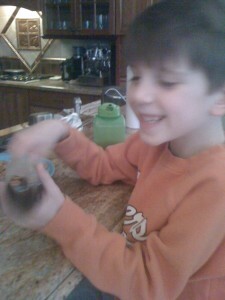 Andrew thought this was quite fun and we experimented in different areas of our house to see where our groundhog saw or didn’t “see” his shadow. I just thought I would share with you something we did in our home to tie in something that appears on the news and may be discussed in school.